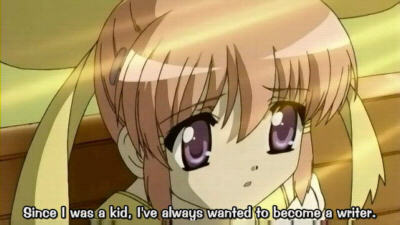 Pic of the day: "Since I was a kid, I've always wanted to become a writer." Actually that is not quite true for me. What is true is that I always wanted to write. I guess there is a subtle difference there. But slowly. It doesn't proceed nearly as fast as I expected. My hand and throat are keeping up reasonably well. But the plot is starting to slide. Once I let the two main characters (well, the two visible main characters) meet, their dialog goes its own way. I have very little influence on it. I planned for a completely different dialog. Luckily this one isn't too bad either. But once they are apart, I have no idea what to write. What are they supposed to do until there is an opportunity to meet again? I don't know. I should have thought of that before, I guess. Perhaps it is not too late to start over. Then again, I really liked the concept. I am just disappointed with the characters, particularly the female protagonist. She is kinda boring, if I may say so. The love interest is not, but if I write anything from his viewpoint I ruin the whole book. The idea is that the reader should not know whether the guy is insane or whether he really lives with some invisible female entity. One new thing this year is that I am using yWriter rather than OpenOffice.org which I have used the earlier years. I am not sure I like this. Perhaps I should have tried it at something else before choosing it for NaNoWriMo. But it is made specifically for writing fiction. Each chapter is stored in a separate plain text file. Then each scene is given its own name and description, along with information like viewpoint character, conflict, goal, level of drama or humor. Even though the different scenes in a chapter are stored in the same file, they are not visible at the same time when you write. This encourages a modular design. I am still not sure if that is right for me. I tend to write very sequentially. Frankly I cannot imagine any situation where I would drag a scene from one chapter to another, for instance. yWriter integrates a bit better with speech recognition software, but not so well that I would drop using DragonPad, the small notepad which comes with Dragon NaturallySpeaking. Dragonpad remembers the speech part associated with each written text part, so you can go back to the previous paragraph (or even further) and correct mistakes as if you had just dictated them. The speech recognition program even learns from the correction so it is less likely to make that mistake again. This feature is lost if you use a text processor, including yWriter. Here you can only correct the last continous line of speech. For typing, yWriter lacks word completion and spelling check which OpenOffice has. It also uses plain text, no cursive (which I tend to use for thoughts), no bold, no headlines or different fonts. If it wasn't for the ability to define scenes ahead of actually writing them, I would drop yWriter in a moment. As it is, I haven't decided on whether to migrate or stay. Three years ago: A society of trust?